new media. new ideas. : Connecting to GLBT Consumers By Just Being Nice! 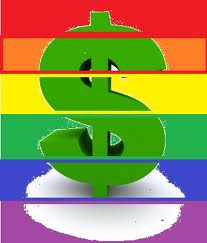 In today’s Advertising Age article “Why (and How) You Should Go After the Gay Dollar” author Bradley Johnson points out some solid ways GLBT consumers and their friends and family can reward companies for taking progressive stands on human equality. According to the article, things are getting much better as we awaken as a culture that we are all just simple humans spinning out of control on this relatively little blue marble in the middle of infinity and under it all, we are equal…although arguably the GLBT community has more disposable purchasing power. The author gives great examples of each and calls out some companies that are not cutting it – so as progressive citizens in favor of human rights, we should cut them from our shopping trips. Despite all this, the question remains is what makes a dollar gay? Is it genetic? Are they gay when their printed at the US mint or do they become gay by being circulated around the Castro District in San Francisco? Did they have overbearing Andrew Jacksons as fathers or overprotective Alexis Hamiltons as mothers? Are these dollars naturally better dressed than their hetero dollar brothers? So many questions, so little solid research to put the debate to rest.